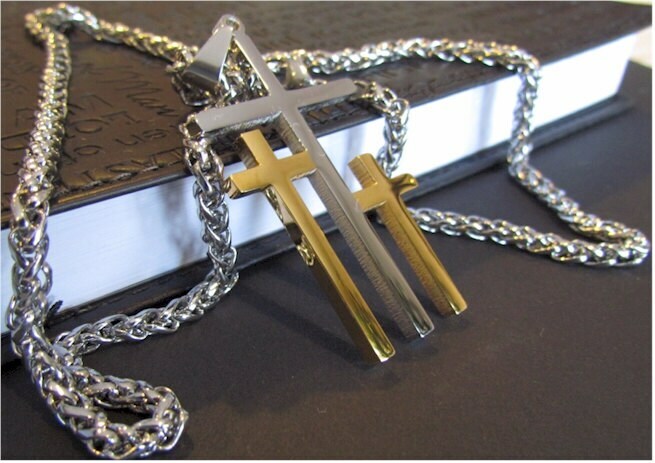 Stunning Silver Stainless Steel Center Calvary 3 Cross with the 2 outside Gold Crosses in 14k Gold Plate! 3 individual Crosses together produce a timeless keepsake with both dimension and texture. Each Cross is a different size and the cross is a substantial 1/8" thick. 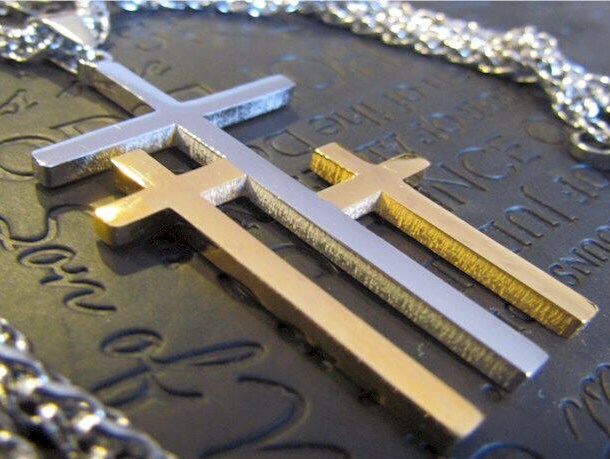 This Cross makes a statement, polished to a High Luster, and substantial in size. The Cross of Calvary's overall size measures 2 1/8” high x 1 1/8” wide x 1/8" thick. 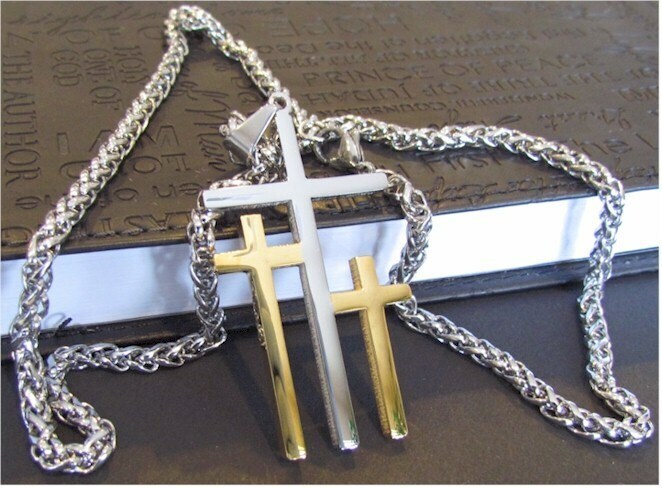 BONUS - this cross comes with a HEAVY 4mm thick 20" braided Stainless Steel chain. 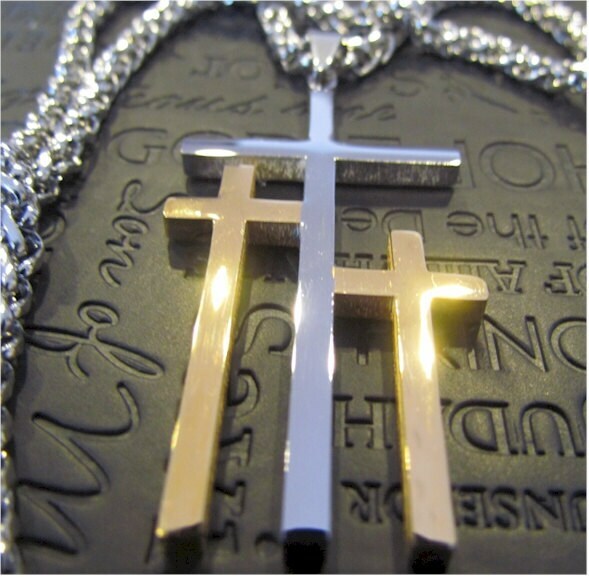 What a great combination of a statement cross and chain. The large center Cross is Christ's Cross of Redemption. The Medium Cross is the Cross of Remorse. The smallest Cross is the Cross of Rejection. Both of the thieve Crosses are dwarfed by the brilliance of Christ's Cross. The entire Cross and Chain are Stainless Steel that it will retain it's luster for many years to come. A Saint Michaels Jewelry Exclusive Design. A custom design that you will find No Where Else Except at Saint Michaels Jewelry.